Home / Mobile Application Development / What is Hybrid Mobile Application and how it is better than native mobile apps? What is Hybrid Mobile Application and how it is better than native mobile apps? With the latest development in mobile and web technology, it is no surprise that there tons of native and mobile web apps right around the corner. It is also one of the reasons why the hiring of mobile application developer has been increasing with leaps and bounds. Just the word ‘native’ and ‘hybrid’ can easily give you an idea about what these apps are. The word native means belonging by the nature and that is what native apps pretty much reflect about. The apps like camera, contacts etc are the native apps that work well even when you do not have web. 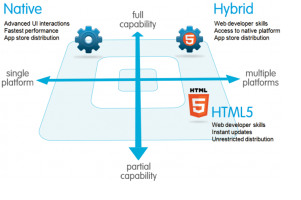 The word hybrid means mixture of two or more components and that is what hybrid app represents. The hybrid app is the combo of both the native apps and mobile web apps. 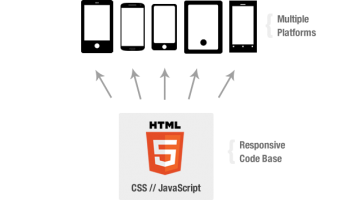 It is the reason why HTML5 Hybrid app development sector has been currently going on a blooming spree. So, what do you think is more better the absolute original one or the mixture one? Since, the hybrid app contains the best of the both world i.e. the native app and mobile web apps, it has more weight regarding which is the best app, than the native app. Now, let’s see why it is the best. Native apps are made to run in a certain platform. The native app made of iOS is not going to run in Android app and vice versa. So, you should not go to an Android Mobile App Development Company and ask them to make you a native app for your iPhone. The hybrid app on the other hand uses the device’s features and contains HTML code as well. So, it can easily run in any kind of platform be it iOS or Android. The hybrid app is like a mobile web app that can access the features of the device that are accessed by native app. A HTML5 Hybrid App Development Company can easily make an app like this for you. Time is an important factor for everyone. You might surely have heard the phrase “Time waits for no one”. So, does it make sense for you to wait for a long time just to get your app developed? The answer would be no. A hired mobile application developer can easily tell you that native apps takes a little too long time to be developed than the hybrid one. So, rather than waiting for the native app to be completed, you can simply choose to develop hybrid app with almost the same feature (plus extra features) in less amount of time. So, the next time you go to an Android Mobile App Development Company you might want to tilt towards the hybrid app.